Sergio Aguero scored his 149th Premier League goal and Kevin De Bruyne returned from two months out as Manchester City beat Burnley 5-0 to reclaim top spot in the Premier League on Saturday. Aguero gave City a first-half lead at the Etihad Stadium but the champions were perhaps fortunate captain Vincent Kompany was not dismissed in the opening minute for a high foul on Aaron Lennon. Goals from Bernardo Silva and Fernandinho early in the second half guaranteed City returned to winning ways after a draw at Liverpool before the international break, with Riyad Mahrez and Leroy Sane adding late gloss to the scoreline. 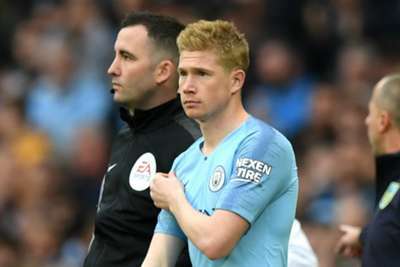 With victory secured, De Bruyne was able to come off the bench for the last 32 minutes to make his first appearance since the opening weekend of the Premier League season. Aguero had already wasted two good chances when he opened the scoring in the 17th minute, finding the net for the seventh time in seven appearances against Burnley. David Silva dazzled the Clarets back line with rapid footwork, swapping passes with Sane before putting the ball on a plate for Aguero to tuck in at the back post. Jeff Hendrick forced a fine block from John Stones and Johann Gudmundsson bent a 25-yard shot just wide as Burnley sought a response before the break. City doubled their lead in controversial circumstances in the 54th minute, Burnley's defence stopping in their tracks as Sane went down under Jack Cork's challenge. David Silva squared for Bernardo Silva to smash home, although the ball appeared to go out of play, with City rapidly doubling their lead as Burnley struggled to regain composure. Sane's corner was only half-cleared and Fernandinho side-footed a 20-yard rocket into the top-right corner. A 3-0 lead allowed Pep Guardiola to bring on De Bruyne, but it was Mahrez who lit up the closing stages with a beautiful 25-yard curler. And a miserable City return for goalkeeper Joe Hart was completed as Sane scuffed in a fifth. With City struggling to show their Premier League form in the Champions League, De Bruyne's comeback appears to be at the perfect time for Guardiola. De Bruyne is the conductor who makes City tick and if they are to compete on multiple fronts this season, he will be key. With City sitting pretty at the top of the league, their ability to absorb De Bruyne's loss has depended much on the form of both David Silva and Bernardo Silva. And the two midfielders were at the top of their game again, the Spaniard recording assists for City's first two goals while the Portuguese added his third Premier League goal of the season. The match would have had a different complexion had referee Jon Moss judged Kompany's first-minute tackle on Lennon more harshly. The City captain appeared nervy throughout and later survived penalty appeals for a handball. - City are now unbeaten in their last 34 Premier League games kicking off at 3pm on a Saturday – the longest ever such run in the competition (W30 D4). - This was City's 23rd Premier League victory by a 5+ goal margin – 10 of them have been under Guardiola. - This was also Burnley’s fourth Premier League defeat by a margin of five or more goals – half of them have been against City. - City's David Silva provided more than one assist in a Premier League game for the 12th time – only Ryan Giggs (17), Cesc Fabregas (17) and Thierry Henry (13) have done so more often. City are in Champions League action this week with a long trip to Kharkiv to play Shakhtar Donetsk on Tuesday, before facing Tottenham at Wembley the following Monday. A day before that blockbuster clash, Burnley host Chelsea at Turf Moor.